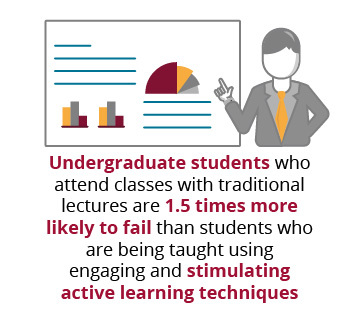 Active Learning: the Future Of Higher Ed? This is the astounding result revealed by a report in the Proceedings of the National Academy of Sciences, after analyzing 225 studies of undergraduate STEM teaching methods. In the higher education landscape, lecturing is definitely the most widely used method of teaching in universities all over the world, but increasingly researchers and educators are becoming activists of more engaging instructional strategies. A variety of studies discussed in the March 2016 issue of The Teaching Professor newsletter, highlights the sustained frequency of lecturing in higher education. However, as technological advances become more pervasive across various sectors, including universities, lecturers will need to ensure the content they teach is being heard, engaged with, and valued. Perhaps the question is not “To lecture or not to lecture?”, but rather, “What is the best way to teach these students a particular skill?”. Perhaps there is a middle ground which more accurately reflects what is happening in the classroom. 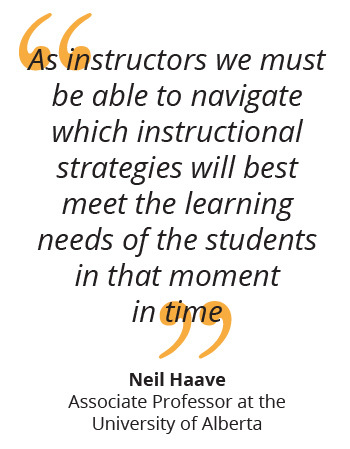 Neil Haave, an associate professor at the University of Alberta, believes that faculty should not only be experts in their disciplinary orientation, but also experts in pedagogy. They should pay as much attention to how they teach as they do to what they teach. With students’ attention being increasingly captured by social media, their need to constantly communicate via text, and the presence of an “always online” mindset, educators may struggle to keep them engaged by simply standing in front of a classroom, speaking to them. Simply put, active learning is the process of learning through interacting with the content. This means students will be asked to participate in learning activities during class that keep them engaged with the learning material, and encourage them to think about the material they are studying rather than just transcribing notes from what a lecturer is saying. The aim of this “lecturing of the future” is on skills development and higher-order thinking rather than just having the intent to convey information. But this is not to say that the lecture is entirely eliminated from the learning process. Rather, educators should focus on “lecturing” in small increments, where they can maintain student attention while giving the bulk of teaching time to active learning. This way academic rigor is maintained, but the classroom also becomes a more engaging and relevant learning environment. Are you ready to transform your teaching career? Gain the advantage by taking the Harvard Teaching and Learning Strategies for Higher Education online short course through GetSmarter.